Are you in between needlepoint projects and looking for super easy quick small patterns to stitch? Then, treat yourself to these two cute cartoon owl needlepoint designs. You can work a "Wise Young Owl" and a "Geeky Owl with Laptop Computer" in your favorite needlepoint stitch techniques on a few pieces of canvas. Ideal for a first project if you are just learning to needlepoint, both owl patterns are 3.57 inches square when worked on 13 mesh needlepoint canvas. They can easily be worked on the same piece of needlepoint canvas a few inches apart to allow you to experiment with a host of embellishments that will make the owls quite unique. These adorable owl designs are perfect for using up surplus needlepoint supplies. Beginners and experienced stitchers as well as anyone else who has done even the smallest amount of needlepoint will have collected a stash of leftover threads and fibers; and the more needlepoint projects you’ve started or completed, the more thread you will have collected. Just use these scraps to complete these two projects, and save some money as well! The needlepoint patterns can easily be printed directly from the online image or downloaded and saved to your computer for future use. The geeky computer owl needlepoint project may be just the thing to stitch and give to someone who loves using computers and other electronic devices. 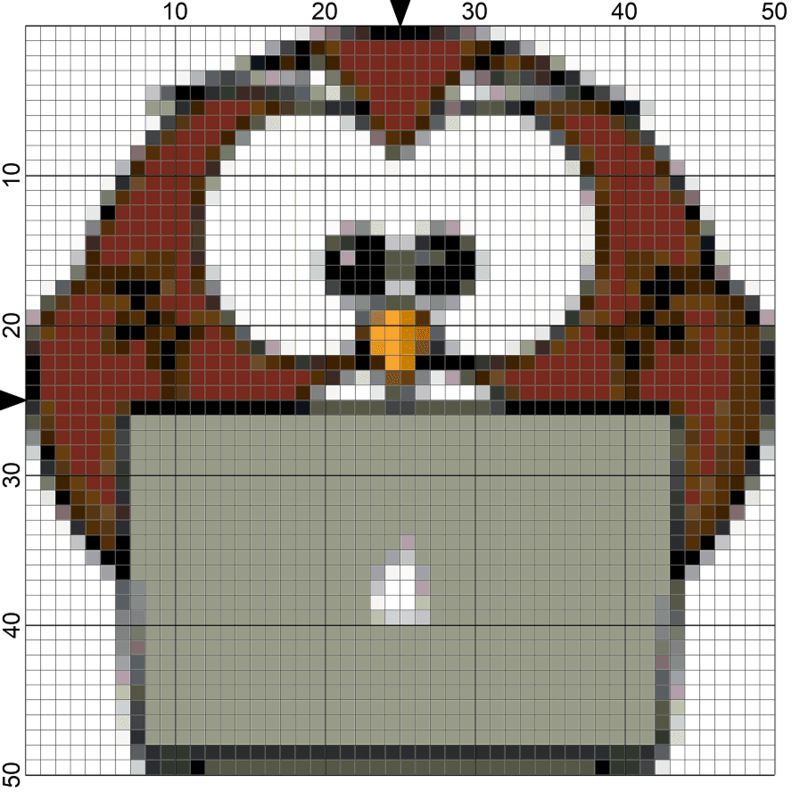 Charted especially for stitching with scrap strands of colorful threads, the adorable owl looks serious as he stares intently at a laptop screen. In addition to the basic tent stitch, you can use other more decorative stitch techniques in your repertoire. For example, the long-and-short stitch would work exceptionally well for the owl feathers. This is also where you will definitely want to experiment with different textured stitches as well as any textured threads in your stash. To personalize the owl design, work a monogram in a classic needlepoint alphabet or stitch a phrase or slogan for custom-looking results. Make sure the needlepoint pattern is correctly positioned by first centering the design on the needlepoint canvas and working from the center of the pattern outward. If you plan to use decorative stitch techniques, draw an outline of that area of the design and then work your stitches within it. This delightfully simple needlepoint pattern is easy to work and can be completed in just one evening—if you have three or four hours free for stitching! It makes a great gift for your favorite "nerd" who loves reading and studying. You can fill in the background as you work the design motif—especially if you’re using the Continental stitch throughout; or, work the background fill area when you’ve finished stitching the entire owl motif. Extend the needlepoint project to any size you desire by working a larger background fill area. Add a library or book-themed needlepoint border around the design for further emphasis. Turn the completed owl needlepoint into an applique or needlework insert for a book cover, backpack or other fashion accessory. Makes a delightful beverage coaster for a study or home office as well. Both needlepoint designs can be personalized with the name or initials of your student; or if you’re really ambitious, a sentimental phrase or message can be worked as well. Use a piece of graph paper, a pencil and an eraser to chart the chosen name or initials. Once you’ve done this, simply find the center of the newly charted area and match this to the center of the area of the needlepoint canvas you wish to place the monogram. Copy the chart stitch for stitch onto the needlepoint canvas using complementary thread colors.